Zap-Zap-Zap-Zap-Zap. Both our hands and thumbs are getting numb and tired. Everseen me and my cousin got the Donkey Kong Bee Hunter *its a hand held game device similar to PSP in term of size but with crispy black and white screen, long cable controller for both 1st player and 2 player and built in good sound effect. The gaming concept is quite simple. 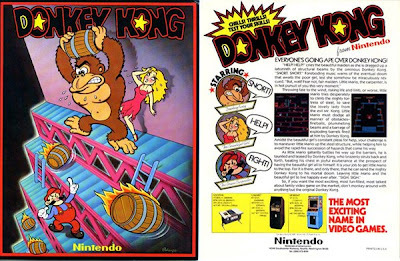 2 Donkey Kong on both opposite platform on both side which consist of 3 level. Zap-Zap-Zap-Zap-Zap. My Donkey Kong end in tear after being stung while my cousin laughed at me again . SIGH....... Anyway I have lot'sa "FUN" that day. Nearly 20 year have passed since that day.Still, Ain't what gaming experiences is all bout?